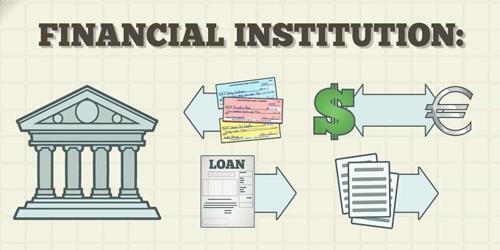 Financial institutions are organizations that deal with a transaction of financial claims and financial assets. It is an establishment that conducts financial transactions such as investments, loans, and deposits. They issue financial claims against themselves for cash and use the proceeds from this issuance to purchase primarily the financial assets of others. Financial institutions primarily collect saving from people, business and government by offering accounts and by issuing securities. The savings are lent to the user of the funds. They also work as the intermediaries between the issuer of securities and the investing public. Everything from depositing money to taking out loans and exchanging currencies must be done through financial institutions. The major categories of financial institutions include central banks, retail and commercial banks, internet banks, credit unions, savings and loans associations, investment banks, investment companies, brokerage firms, insurance companies, and mortgage companies. Thus, financial institutions are specialized firms that facilitate the transfer of funds from savers to borrowers. They offer accounts to the savers and in turn, the money deposited is used to buy the financial assets issued by other forms. encompass a broad range of business operations within the financial services sector, including banks, trust companies, insurance companies, brokerage firms, and investment dealers. Similarly, they also issue the financial claims against themselves and the proceeds are used to buy the securities of other firms. Since financial claims simply represent the liability side of the balance sheet for an organization, the key distinction between financial institution and other types of organizations involves what is on the assets side of the balance sheet. It encompasses a broad range of business operations within the financial services sector, including banks, trust companies, insurance companies, brokerage firms, and investment dealers. For example, a typical commercial bank issues financial claims against itself in the form of debt (for instance, checking and savings accounts) and equity; and so does a typical manufacturing firm. However, the structure of assets held by a commercial bank reveals that most of the bank’s money is invested in loans to individuals, corporations, and government as well. On the other hand, typical manufacturing firm invests primarily in real assets. Accordingly, banks are classified as financial institutions and manufacturing firms are not. Besides commercial banks, other examples of financial institutions are finance companies, insurance companies, credit unions, pension funds, mutual funds savings and loan associations, and so on.